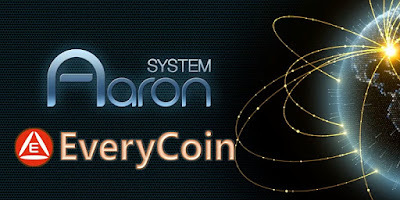 EveryCoin is a key currency of the Aaron Platform. The Aaron Platform is a new financial platform that combines stable coin(TabiPay) with fluid value coin(EveryCoin) to solve the problems of blockchain speed and high variability of cryptocurrency. EveryCoin has opened bounty program for appreciation and congratulations. There are various ways to participate in our bounty program. You can choose the social network platform which is familiar with you. If you are interested in EveryCoin project more, you can create your article or video to get more bounty. Join to EveryCoin: Telegram, Twitter, Facebook. Create yourself: Blog, Media, Articles, YouTube, Telegram, Twitter, Facebook. More details are in bounty page at this link. > When you participate in the bounty program, please fill out the application form correctly. Especially, check the Telegram ID and Ether wallet address again. > For getting more bounty, when you write an article or create a video, please tell your opinion. Don't copy and paste the EveryCoin homepage or whitepaper. EveryCoin will be listed on IDAX Exchange. IDAX(global blockchain digital asset exchange) announced that EYC(EveryCoin) is about to enter their platform Avatar IDAX on 28 Sep 2018. We already have partnerships with big cryptocurrency exchanges, and will increase the trading markets of EveryCoin continually. The investors will be able to trade EveryCoin on the trustworthy market. IDAX is a global cryptocurrency exchange which is ranked top 10 at CoinMarketCap and more than $170million are traded on IDAX in a day. IDAX (International Digital Asset Exchange) company is originated from GBC (Global Blockchain Research Center), an international blockchain research center and it’s a global digital assets service platform that is designed for blockchain exchange research.IDAX operates from GBC high-tech industrial complex in Ulaanbaatar. Our industrial complex has 33.000 M2 workspaces. The platform is designed to be trustworthy and user-friendly cryptocurrency exchange which is supported with many functions such as multi-crypto currency, multi-language options, and multi-levels of security architect that ensures a safe transaction of digital asset exchange. We also strive to develop source integration, cross-border strategic partnership and develop the financial techs, and by doing so we’ll be able to boost the IDAX platform’s innovation and the developmental processes.We are in operation, in order to establish the highest quality digital asset exchange platform of the blockchain globalization according to the “Secure, prompt, stable, sophisticated/precise” activity guidance. The EveryCoin and TabiPay will enable financially excluded persons, who have not received financial services, to receive financial services. How does EveryCoin keep its growth?